Add 1 cup sliced mushrooms with tomatoes. Add 1 cup chopped kale or other greens with tomatoes. In large sauce pot, cook ground beef over medium heat. Drain fat. Add carrots, onion, celery, and garlic; stir often and cook for about 5 minutes. Add 8 cups of water, bouillon, tomatoes with juice, barley, and pepper. Bring to a boil. Cover and reduce heat to a low boil. 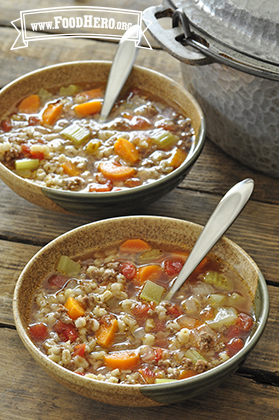 Cook for about 30 minutes or until barley is as tender as you like it. 1 Comments for "Beef Barley Soup"
Very good for a soup that only took 40 minutes to cook! Adding tomato stock might be nice and make the broth a little more flavorful.